We really dug the first issue of DC Comics' new rough-and-tumble fantasy series Demon Knights. Hence, we're psyched to debut an exclusive sneak peek of the second issue. 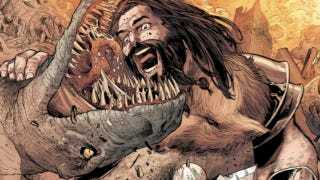 In this preview, Paul Cornell pens Vandal Savage wrestling with scaly fauna. That's a platform I can get behind. The siege that will reverberate through history to the present-day DCU begins as the Demon Etrigan and his unlikely lover, Madame Xanadu, face the Horde! What five (mostly) noble souls would be crazy enough to join them? The cover gives but a hint, and the point could well be moot by the time this issue's done. For the Horde is armed with the magic of Mordru – including some decidedly different dragons!